(Dubai) – His Highness Sheikh Mohammed bin Rashid Al Maktoum, the Vice President, Prime Minister and Ruler of Dubai, was crowned winner of the English classic Investec Derby horse race at Epsom, England after Godolphin’s Masar beat odds and snatched the derby title. 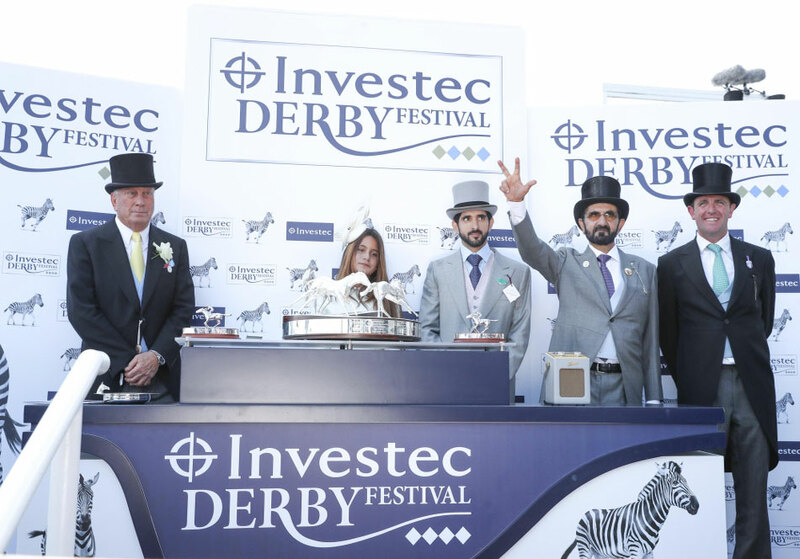 His Highness Sheikh Mohammed received the Investec Derby trophy amid cheering from the crowds and in presence of H.H. Sheikh Hamdan bin Mohammed bin Rashid Al Maktoum, Crown Prince of Dubai and H.H. Sheikha Al Jalila bint Mohammed bin Rashid Al Maktoum. Praising the Godolphin team for their impressive track record and strong presence in the English classic horse races, Sheikh Mohammed said that today’s triumph is a result of outstanding teamwork and a step on the royal blue silks’ quest to win more trophies. Riding Godolphin’s Masar to victory, William Buick left the second place to the horse Dee Ex Bee, which is owned by His Highness Sheikh Hamdan bin Mohammed bin Rashid Al Maktoum. Masar is trained by Charlie Appleby and Dee Ex Bee is trained by Mark Johnston. On the side lines of the race, His Highness Sheikh Mohammed met with Her Majesty Queen Elizabeth II in presence of the Dubai Crown Prince. The meeting discussed building on the successful bilateral relations between the United Arab Emirates and the United Kingdom in all sectors. The race was also attended by Wife of His Highness Sheikh Mohammed bin Rashid Al Maktoum HRH Princess Haya bint Al Hussein, sheikhs, officials and horse race enthusiasts.